It is noon here on the east coast; the news is flooding in on events in Libya and already, the propaganda is saturating the airwaves along predictable partisan lines. And, as usual, unless you take in divergent viewpoints, you will get the story all wrong. First, especially for those of you who have only gotten your news from blogs; please, listen to Secretary Clinton’s live briefing from the U.S. State Department. 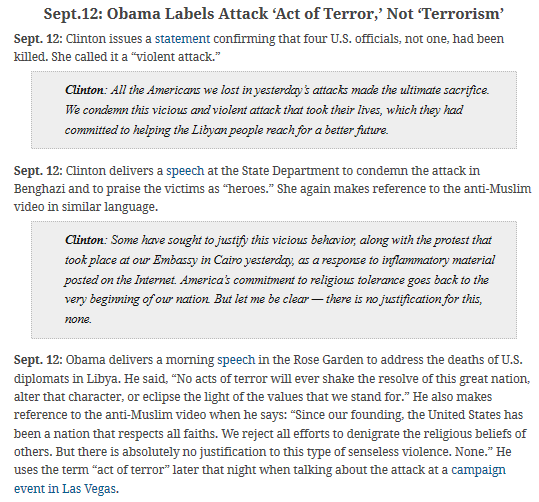 Secretary Clinton’s remarks can help to place in their proper perspective those reports and images found on the likes of Drudge on the one end or The Boston Globe on the other; I was particularly struck by the clarity offered by just a few lines, not necessarily spoken in this order. When the attack came yesterday, Libyans stood and fought to defend our post, some were wounded. Libyans carried Chris’ body to the hospital and they helped rescue and lead others to safety. …we must be clear-eyed in our grief. This was an attack by a small and savage group, not the people or the government of Libya. A COUP, THROUGH and THROUGH (3 of 4) is the third installment in the 4-part series describing the fraud pulled off at the 2008 DNC Services Corporation Presidential Nominating Convention in order to ensure Barack Obama would receive the nomination so that his name would appear next to the D on the general election ballot. 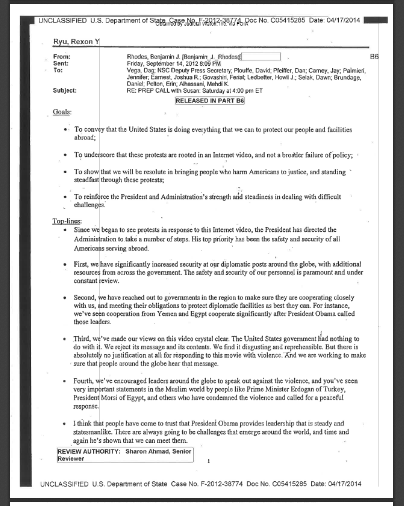 The groundwork for the present article, “The Coup at the Convention,” was laid in the first 2 (two) installments, A COUP, THROUGH and THROUGH (1 of 4); and A COUP, THROUGH and THROUGH (2 of 4). Trust me, if you understand what got us here, to the convention, then you are now at the same jumping off point as those people who were determined to steal the nomination. Yep; just like you, from here on in, they were winging it, too. Because something they hadn’t anticipated happened at the start of the convention which could have derailed their best laid plans to obtain the nomination. Indeed, as I wasn’t there, it is only in retrospect I can explain to you what I later realized is about to go down, notwithstanding as it turns out, I was responsible for what happened next. Judging by how hard they had fought to elbow Clinton out of the race at the beginning of the primary and caucus contests, powerful parties interested in placing Obama in the White House knew from the start, the only certain way to force this flawed candidate on the American people was to limit his exposure to public scrutiny by sewing up his nomination well in advance of the August 25 nominating convention. They failed, miserably. Indeed, while publicly maintaining since February, his nomination was a fait accompli; even they didn’t feel comfortable enough until August 14 that, having strong-armed a sufficient number of pledged delegates and paid off the rest, no matter what, they would pull off the nomination in an open roll call vote of pledged delegates from all states on the floor of the convention; to concede consistent with past practice the name of any other candidate seeking the nomination should also be formally entered into the roll. Yes, they were confident on August 14 and for almost the next 11 (eleven) days that their Herculean investments in his candidacy over the past couple of years would pay off, better late than never. And in the end, even accounting for the open roll call vote of pledged delegates from every state, from the floor of the convention, he would walk away with the nomination. 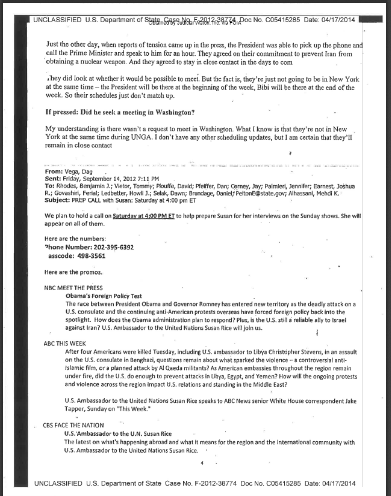 Have Senate Majority Leader Harry Reid (D-NV) recruit Obama in the summer of 2006 to run against Clinton for the 2008 Presidential nomination? Check. Immediately thereafter, have DNC Chair Howard Dean rig the delegate apportionment process so as to ensure that Clinton, despite winning on account of real votes cast in state contests for her, would nonetheless lose and Obama, despite losing the actual vote count, would win? Check, check, and check. Have him appoint Pentacostal Preacher Leah Daughtry, DNC Chief of Staff, to be the CEO of the 2008 DNC Services Corporation Presidential Nominating Convention? Check. Have him make Nancy Pelosi (D-CA), Speaker of the U.S. House of Representatives and 3rd in line of Presidential succession, the Chair of the 2008 Convention thus enabling her to control the nomination process (and after making him the nominee, to co-sign the Certification of his Nomination swearing to election officials he is Constitutionally eligible to be President to get them to print his name on the ballot in states whose laws only allow on the ballot the names of candidates who are legally qualified for the job)? Check. Then, on August 25, the first day of the convention, something unexpected happened which began to unsettle his henchmen; and which, by Tuesday, August 26, the second night of the convention, had panicked them into pulling a bait and switch on the scheduled roll call vote of pledged delegates from all states on the floor of the convention, scrambling to preserve the chance that just through the use of that roll call, he could get the nomination. That’s when they scrapped the scheduled open roll call vote of all states on the floor of the convention, simultaneously orchestrating a convoluted ploy affording them plausible deniability, they had not. Last night, convention secretary Alice Germond; ah, Jeff Berman, who is a senior adviser to the Barack Obama campaign; and Craig Smith who is a senior adviser to Hillary Clinton sent out a joint note to, um, all of the state delegation chairs with some information about, um, Wednesday’s roll call vote. Ah, basically, um, here’s the guidance that we can give you, ah, so far. Ah, last night and this morning, state delegations received vote tally sheets for their delegates. Um, throughout the day today they’ll be distributing those tally sheets to their delegates. Um, the cheat sheets will be completed by 4pm mountain time. Eh, today from about 3 to 5pm mountain time the voting and roll call procedure will happen. Um, the convention will gavel open at 3, ah, there’ll be, um, 3 nominating speeches, um, for Senator Clinton, a nominating speech and seconding speeches, ah, and then a nominating speech and 3 seconding speeches for Senator Obama. Ah, they will, ah, each candidate’s speeches will total, ah, no more than 15 minutes, so that’ll be about a half an hour of speeches. Once the speeches are concluded the vote tally sheets will be collected, ah, by the office of the secretary, ah, and then we will begin the roll call of the states and the delegation chair or her designee will announce the totals for each candidate. So, that’s the procedure how the roll call vote is gonna work today. Um, and, ah, you can look forward to later this morning, ah, a joint statement from the Clinton and Obama office about who will be giving those nominating speeches, um, for each of us. A reporter from BBC (whose name I did not get) asked, “…in reference to the roll call vote, I just wanted to confirm that there’s not going to be stoppage of, of any sort of states, that all 50 states will have their say and their vote tallies announced, right? There won’t be any kind of stopping?” Id. Ms. Backus replied, “Um, the guidance that we’re giving you on the roll call vote is basically exactly what I just, ah, said to you right there. Um, it will go from, ah, 3 to 5pm mountain, ah, which is 5 to 7pm eastern, um, and that’s the procedure on how it’s gonna work.” Id. Joe Manus, St. Louis Post Dispatch asked, “So the roll call will be at the beginning of tonight’s proceedings; and will the states be doing their unofficial tallies like this morning at the breaksfast?” Id. “States will, um, begin to do their, um, unofficial tallies at the breakfast and throughout the day, um, and they will turn in those tally sheets, ah, this evening after either during or after, um, the nominating speeches before the call of the roll begins.” Id. In sum, Ms. Backus told the press, pledged delegates will begin voting at their hotels this morning and throughout the day as delegation chairs distribute the “cheat sheets” to members of their delegations, only until 4:00 mountain time, when they are due to be delivered to the floor of the convention to be added into state totals which will be announced during the roll call of all states on the floor of the convention beginning at 3:00 mountain time. Delegates awoke on Wednesday, August 27, and shuffled off to another round of state delegation breakfasts where, in addition to their coffee and tea, they were now served up this bitter elixir from their delegation chairs. They would have to cast votes for their candidates after breakfast, in the hotel, behind closed doors, and then re-group on the floor of the convention. Chairman Richie was upset both visibility and emotionally when some delegates asked whether observers would be present during the voting process. “We’re all Democrats”, said Richie in an angry tone. Finally, after several interruptions from some delegates requesting an observer, he asked the Obama registered agent Ron Kirk and Hillary registered agent Garry Mauro whether they wanted observers. Registered agents are the official representatives for campaigns. Mr. Kirk said they [Obama delegates] were not interested in having observers. As he said this, some Obama supporters began to chant, “Unity, unity.” In place of Mr. Mauro, John Oeffinger represented the Hillary campaign and honored the request of Hillary delegates to assign observers. John then immediately scrambled about the ballroom to schedule observers in shifts. After voting, we were sent to a table to obtain our seating assignment for this evenings Roll Call Vote at the Pepsi Center. So, how many times do we vote? Which one counts? I guess we’ll find out tonight. COLORADO CONVENTION CENTER — Each state at tonight’s session of the Democratic National Convention will announce the results of its delegate tally during a roll call that has been the source of much speculation and controversy this week. Convention committee CEO Leah D. Daughtry said the roll call will take place as it has in previous conventions, despite speculations that a compromise between Sens. Barack Obama and Hillary Clinton might result in a departure from the usual process. The roll call will begin with each state announcing its delegate vote totals for the two Democratic candidates after a series nominating and seconding speeches for Clinton and Obama, Daughtry said. “Guided by the rules of the party…just as the rules dictate?” Rules? What rules? This drivel points to why I said in COUP (2 of 4), it’s useless trying to reinstate order to the Democrat’s Presidential nominating process by falling back on the rules, regulations, and Charter of the Democratic Party. There’s a bit of confusion about the plans for a roll call, and some Democrats say they’re dissatisfied by a process that has them voting in private, by state. But that’s the old-fashioned way, says my colleague Andy Glass, who’s covered these for years. But whichever version of events you bought into – “just as the rules dictate”; “the old-fashioned way”; or ‘play it by ear’ – one thing was clear. From the outside looking in, it wasn’t easy to recognize these events for what they were: the signal that Obama’s warriors had decided at the last minute to scrub the scheduled open roll call vote of pledged delegates from all states on the floor of the convention, which was expected to have been followed by Clinton’s release of her pledged delegates, and then another vote after that, which was supposed to give him the nomination. Incredible, huh. Thousands of eye witnesses in Denver, including the press, scrutinizing every detail of the goings on inside the convention, and no one asked why whoever was in charge had decided to scrap the open roll call of pledged delegates. Why? Because they lacked the information necessary to recognize what they were observing. So, what was this ‘thing’ that happened under everyone’s nose yet flew under the radar, so significant it caused Obama’s allies in the DNC to re-orient the nomination process at the last minute in order to hide votes for Clinton from her pledged delegates as the preferred means to guarantee his nomination? Word had spread to the Clinton pledged delegates sent to the convention from those 13 vote binding states, including CA, that the laws in their states required them to hold fast to their candidate through at least the first round of voting at the convention; and that their Attorneys General had received complaints Obama’s people were subverting the law by trying to get those delegates to promise to switch their votes to him, even before they got to the convention. We know that at least one of those A’sG, Thurbert Baker (D-GA), instructed that state’s pledged delegates to obey the law. Consequently, these delegates were going to obey the law, and vote for her through at least the first round. Some, including Clinton pledged delegates from CA, even after that. So, why was this such a big deal? BECAUSE OBAMA AND HIS CONSORTS HAD ONLY AGREED TO HOLD AN OPEN ROLL CALL VOTE ON THE FLOOR OF THE CONVENTION RELYING ON THE FACT, SEVERAL HUNDRED CLINTON PLEDGED DELEGATES FROM VOTE BINDING STATES WOULD HAVE NO IDEA THEY WERE ‘PLEDGED’ PLEDGED TO CLINTON WHEN THEY REACHED THE FLOOR OF THE CONVENTION. Thus, those pledged delegates who had already been successfully co-opted to switch their votes to him, added to those who would enthusiastically switch to him in the fabricated momentum of the occasion; plus those who would fatalistically give in to the feigned inevitability of his nomination, would easily put his numbers over the top. 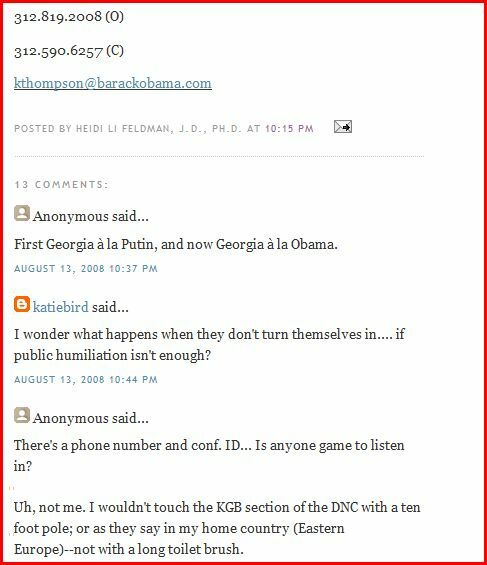 But didn’t I say, in COUP (1 of 4), Obama’s agents would have known which states had vote binding laws before they twisted the arms of Clinton delegates in those states since the state delegate selection Plan sent to the RBC for approval had to include details of any state laws respecting the conduct at the convention of pledged delegates from that state? Yep; that’s what I said. So now you’re probably thinking, ‘well, jbjd, if Obama’s people knew about the laws in those states by looking at those delegate selection Plans then, wouldn’t any delegates seeking guidance as to their conduct at the convention by examining the state Plan, be able to read about the state’s vote binding status, too?’ Nope. Know why? Because there was nothing in those state Plans about vote binding laws. And now you are probably shaking your heads. Why did I say the Plans submitted to the RBC explain how Obama’s people knew in advance which states had vote binding laws if the Plans contain no information about vote binding laws! To answer this question, you have to read the fine print in the RBC Regulations. Section 2, Submission and Review of Plans, regulation 2.2, Formal Submission, reads, “Each State Party Committee shall include the following documentation with the submission of its Plan to the RBC…” “I., “… a copy of all state statutes reasonably related to the delegate selection process…” Id. Did you catch that? The rules don’t say, this documentation about special state laws regarding how pledged delegates must vote at the convention is a part of the state delegate selection Plan. The RBC rules only tell the state committee, when submitting the delegate selection Plan for our approval, you have to attach this additional information. In other words, this additional information forwarded to the RBC by the state party about special state laws respecting party delegates – this would include laws spelling out how to submit to state election officials the name of the Presidential nominee to be printed on the state ballot – does not become a part of the accompanying state delegate Plan. Wanna see? Here’s California’s approved 2008 Delegate Selection Plan. 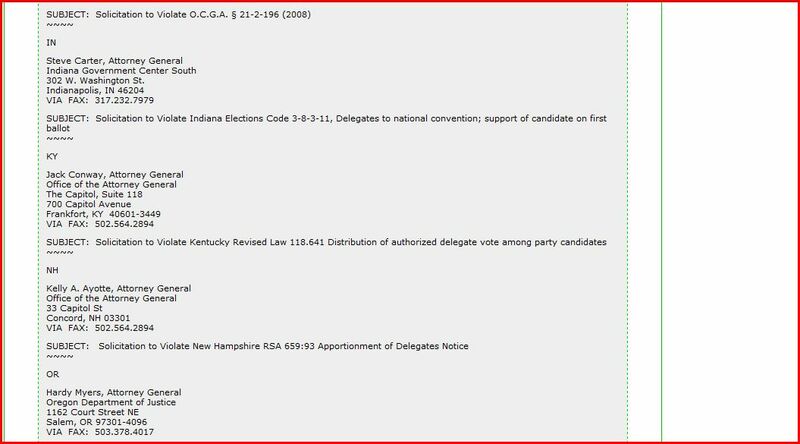 Nothing in either the Table of Contents or the body of the Plan, references any special laws requiring pledged delegates to vote for the candidate voters in that state elected them to represent, on the floor of the convention. “Good conscience.” But nothing about the law! Here’s just a sample of language I pulled together from the laws in some of those vote binding states. The majority of pledged delegates from vote binding states were unaware of their special status coming into the convention. How can I prove this? And, more importantly, how do I know that news of their obligations under the vote binding laws of their states still managed to reach Clinton pledged delegates? And that this new found knowledge was a game changer to the roll call vote? In the summer of 2008, I was only one of hundreds of citizen activists who became immersed in the machinations of the Presidential nominating process of the Democratic Party. As I previously explained, one of my contributions was to ‘discover’ and then publicize the existence of those 13 vote binding states. As I wrote in A COUP, THROUGH and THROUGH (2 of 4), my work did not immediately ignite the endorsement of people who could have spearheaded a massive public education campaign in advance of the convention. GA was the one state in which I and my team of Georgians were able to get out a concerted campaign to alert both Clinton pledged delegates and AG Baker, Obama’s agents were breaking the law. And, as a result, AG Baker reminded delegates in that state, “pledged” means pledged. Id. Eventually, in the days immediately preceding the convention, my work on vote binding states did attract the attention of members of the party who, previously unaware these laws existed, saw the strategic value of the work to support the Clinton campaign. Id. 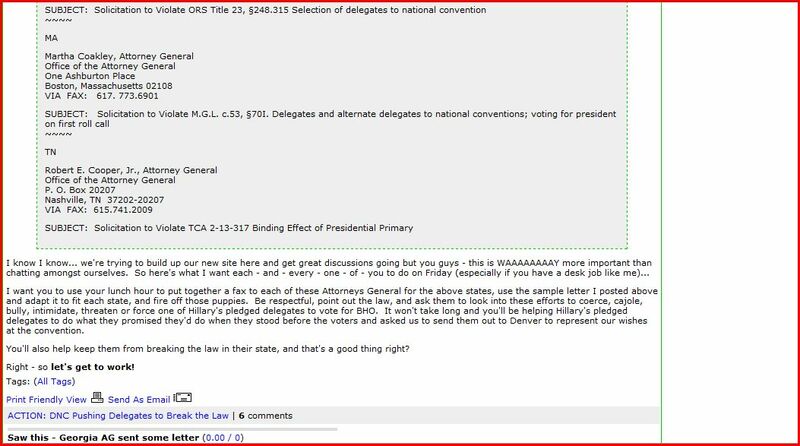 But what I hadn’t yet told you, is that my work on vote binding states also attracted the attention of another citizen activist, from CA, who not only managed to get inside the convention, but who also had a hand in assembling packets of information that were distributed to all delegates. Guess what she slipped into these delegate packets? Yep; my materials on the laws regarding the votes of pledged delegates from vote binding states. Nancy Pelosi, Chair of the 2008 DNC Convention, was a member of the CA delegation. She addressed the CA delegates at their first delegation breakfast on Monday, August 25. Listen as she not-so-subtly twisted arms to get Clinton pledged delegates to violate CA law. Imagine, the Chair of the 2008 DNC Convention, soliciting Clinton pledged delegates to abandon the will of the voters, in defiance of the law, in order to support her candidate of choice? Imagine being a Clinton pledged delegate sitting in the audience under the watchful eye of the powerful Madame Speaker; holding a packet of materials that informed you for the first time, you are from a vote binding state. How free do you suppose you would feel to question what she was saying, let alone to express disdain at what she was asking you to do? Another member of the CA delegation receiving this information was Attorney Gloria Allred, a Clinton pledged delegate. Watch while she informs reporters when Monday’s breakfast was over, that fellow delegates had asked her to research whether the law required them to vote for Clinton on the first round of balloting. (Some confusion arose because CA election law applicable to either the D or the R Presidential preference primary is codified in separate sections. But D delegates are bound by law to the candidate voters elected them to represent, arguably until a candidate is nominated at the convention.) Ms. Allred makes a point of saying, she will vote for Clinton on the first round in order to carry out the will of the voters who elected her; but makes clear, she does not yet know whether such a result is required by law. That night, Pelosi, Obama, Dean, and Reid, et al. decided to call off the open roll call vote of all states scheduled to take place Wednesday evening on the floor of the convention. So, instead of waiting until after the first round of voting during the open roll call of all states on the floor of the convention, Clinton released her delegates early Wednesday afternoon. AFTER THE FIRST ROUND OF VOTING (albeit behind closed doors at the hotel). Now, technically, according to some of these vote binding laws, pledged delegates from vote binding states were free to vote for the candidate they in “good conscience” (from the DNC Delegate Selection Plan) concluded was a “fair reflection” (from the DNC Charter) of the will of the voters who (indirectly) elected them. And they might have, except for one thing: having already voted once, back at the hotel, they would have no opportunity to vote again. This last minute early release of Clinton delegates from their pledges could have created another problem if it hadn’t also escaped detection. See, since Clinton did not release her delegates until Wednesday afternoon; when Clinton pledged delegates from vote binding states voted at their hotels Wednesday morning, they had to vote for her according to the law. Thus, any vote totals from those 13 vote binding states that were then transmitted to the Secretary should have reflected the number of delegates appointed as the result of votes cast in the state for the candidate, at the time of the primary or caucus contest, right? Not surprisingly, they did not. The DNC refuses to release an ‘official’ tally of votes cast in the hotels, by whom. I received an email from a KY Clinton pledged delegate who said her delegation chair, Jennifer Moore, ignored her request for a list of that state’s votes, too. 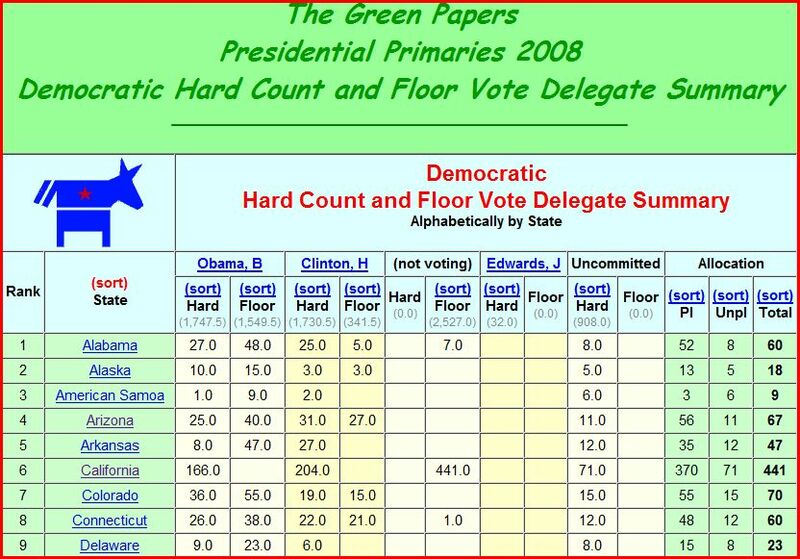 Shortly after the convention, the DNC did release some kind of tally sheet that included ALL states, not just those states voting on the floor of the convention; but they rescinded that list shortly thereafter. 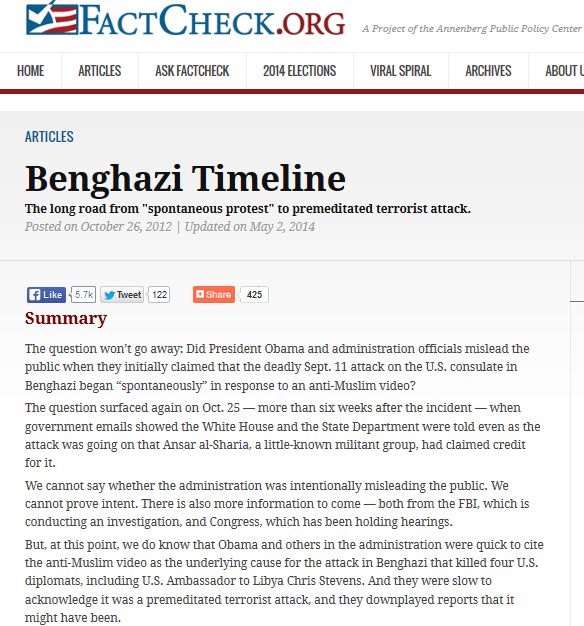 The GreenPapers published that list, with links, that are now inoperative. In the 2 (two) years since the convention, the DNC has failed to post another list. According to Andy Glass at Politico, “…there’s not even any formal mechanism within national party rules for each delegate’s vote to be recorded. What’s recorded is the vote of each state delegation.” Id. This means, while we can establish which of Obama’s agents suborned Clinton pledged delegates in vote binding states to violate their pledge; we cannot determine which of those delegates ended up breaking the law. Including those pledged delegates who are PLEO‘s, or party leaders and elected officials, like mayors, governors, city councilors, and legislative leaders. And this brings us to the heart of the matter involving Clinton pledged delegates from vote binding states: the unpledged PLEO’s, better known as super delegates. See, here’s the thing. As long as pledged delegates from vote binding states remained unaware of their bound status, Obama could have managed to convert an only slight (contrived) lead in pledged delegates into a landslide win. Only, this landslide was in jeopardy once pledged delegates from vote binding states learned they were bound by the law. But so what? Even without any shenanigans with respect to any of the pledged delegates, based strictly on the number of pledged delegates awarded immediately after the primary and caucus contests ended; neither Clinton nor Obama had the requisite number of votes from pledged delegates alone to win the nomination. Certainly not on the first round. At some point, if the typical give and take expected of such political theater could not produce a nominee, the unpledged PLEO’s would have broken the impasse. And the majority of these unpledged PLEO’s had already come out publicly in support of Obama, even in states where Clinton had won the popular vote. In other words, whatever happened along the way, in the end Obama was set to run off with the nomination. So, why the mad rush to take the nomination just from votes cast by pledged delegates? For those elected officials who had endorsed a candidate as of Feb. 25, the presidential candidate who gave more money to the superdelegate received the endorsement 82 percent of the time. In cases where Obama had made a contribution since 2005 but Clinton had given the superdelegate nothing, Obama got the superdelegate’s support 85 percent of the time. And Clinton got the support of 75 percent of superdelegates who got money from her but not from Obama. For this update to the Feb. 14 study the Center combined contribution data with a list of superdelegates and their endorsements compiled by The Politico as of Feb. 25. …including Madame Pelosi, his biggest ‘vote fairy godmother’ of all. As Americans sat glued to their television sets watching the most hotly contested presidential primary in American history, pundits counted pledged delegates won in caucuses and primaries and discussed the highly prized superdelegates’ endorsements. Eventually it would be these superdelegates, Democratic officials, governors, and members of congress, who would determine the nominee, since neither contestant won enough pledged delegates in the 52 primary contests. What the pundits forgot to tell the American public was that these superdelegates were doing some counting of their own. They weren’t counting how many of their constituents had voted for Senator Clinton or Senator Obama, but rather how much money was being put into their war chests by the Obama campaign and the Democratic hierarchy. This money, moved from one candidate to another via PAC’s, would determine their endorsements and ultimately the nomination…. And that’s why they pulled off the coup that hid hundreds of votes of Clinton pledged delegates from vote binding states at the 2008 DNC Services Corporation Presidential Nominating Convention. For readers expecting a sort of summation of the ‘lesson learned’ from all four installments of “A COUP, THROUGH and THROUGH,” the main focus of which series was the fraud pulled off at the 2008 DNC Services Corporation Presidential Nominating Convention, I offer this. “I can only imagine Clinton would have made a much better President than Obama but, based on how he obtained the nomination, I anticipated he would make a much better crook.” jbjd. A lay person looking at this chart of delegates can easily read, the total number of delegates for either candidate fails to get the nomination. But Obama had bought off a sufficient number of these super delegates to help him steal the nomination. So, even with a real open roll call vote of all states from the floor of the convention, before the arm twisting and poaching, eventually, the super delegates would have had to intervene to break the impasse. Much of this article consists of comments I posted on blogs in August 2008, which provide historical and retrospective context for the conclusions at which I presently arrive. 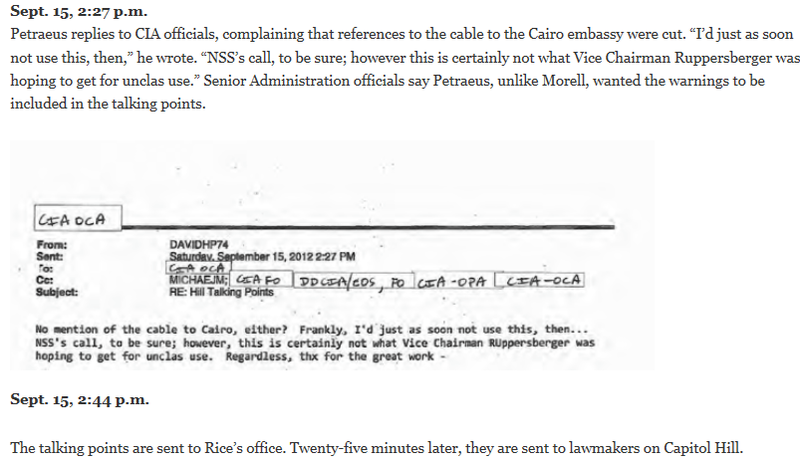 PLEASE READ THESE COMMENTS, in order, while imagining you are a part of the Obama campaign’s team of dirty tricksters. This will help you to understand the way in which events leading up to the convention unfolded, and how and why in the end, they had to pull off a coup in order to secure the nomination. Recall that the motive of the movers and shakers behind candidate Obama, was to get his name on the general election ballot by making him the nominee of the Democratic Party as far as possible in advance of the 2008 DNC Services Corporation Presidential Nominating Convention. But notwithstanding the nefarious means they had employed throughout the primary and caucus contests, they had nonetheless failed to secure the nomination. No matter what they tried, they could not undermine Clinton into relinquishing her bid for the nomination. Why, even now that the primary season was over, the candidate only suspended but did not end her campaign. So, over the summer Obama’s minions, having failed to secure the nomination based on the number of delegates pledged to him, now set out to corral the hundreds of delegates pledged to her, determined to steal his nomination before the convention. I only created the “jbjd” blog in late August, 2008, after the convention. So, in June, after Clinton suspended her bid for the nomination, I continued commenting on other people’s blogs. For the most part, my focus was fixed on ridding the blogosphere of its misconceptions about specific facts related to the Obama and Clinton narratives, and not on improving people’s understanding of the electoral process. Because back then, I was as ignorant as to the nuts and bolts of our Constitutional republic as the average citizen 2 (two) years later, remains. Especially with respect to the role played by our 2 (two) major political parties. Responding to rumors she might not be formally entered into nomination, Clinton supporters began pushing to ensure her name would appear on the ballot at the convention. According to DNC rules – by August, I was studying those rules – this would require the signatures of at least 300 pledged delegates, as well as the candidate. Her pledged delegates from all over the country had been demanding the opportunity to ‘represent’ the candidate the voters elected them to vote for at the convention. And, like the rest of us who had watched that May 31 meeting of the RBC, they were still smarting from the treatment their candidate had received at the hands of other members of her party. As a result, gathering the 300 signatures would be easy. But here was another problem. The Chair could refuse to enter into nomination anyone who failed to demonstrate loyalty to the Democratic Party. In light of the meme from party officials that Obama’s nomination was already a fait accompli, putting her signature on such a petition could be construed as evidence she was being disloyal to the party, which perceived disloyalty could become a bar to her formal nomination. With strong grassroots efforts underway to secure her nomination, on August 10, AP’s Nedra Pickler offered up “Clinton to headline second night of convention,” subsequently published by both MSNBC and RealClearPolitics, portraying the Clinton and Obama ‘camps’ were negotiating to determine whether her name would formally be entered into nomination. Clinton told supporters she is seeking a way for her delegates to be heard at the convention and be united after the hard-fought nominating contest. “Because I know from just what I’m hearing, that there’s incredible pent up desire. And I think that people want to feel like, ‘OK, it’s a catharsis, we’re here, we did it, and then everybody get behind Sen. Obama.’ That is what most people believe is the best way to go,” she said, according to video of the remarks taken by an attendee and posted on YouTube last week. “I don’t think we’re looking for catharsis,” said Obama. “I think what we’re looking for is energy and excitement.” Id. Delegates are not formally pledged to any candidate so Clinton does not need to “release” them to Obama. The rules also say delegates may vote for the candidate of their choice whether or not the name of such candidate was placed in nomination. Id. As my readers can attest, discussing these issues I struggle to view the glass as half full rather than half empty. With this optimistic life view in mind, I refuse to characterize that AP, MSNBC, and RCP reporters and editors intentionally withheld from millions of their readers the material fact, laws in 13 states do bind pledged delegates to the candidate of the voters’ choice. Instead, I will grant, they just didn’t know. Because on August 10, I still didn’t know. But by August 13, hearing bits and pieces from here and there, I was beginning to put it together. I heard news reports that a Clinton delegate in CO was being pressured by the state chair of the party to change her support to Obama and had hired a lawyer to deal with the situation! Now, I looked up DNC model delegate selection rules to determine whether this Clinton pledged delegate could change her mind. DNC rules tell pledged delegates to use their “good conscience” to represent the will of the voters who elected them. Viewed in this light, the state chair who was pressuring her to change her mind to Obama could be construed to be merely encouraging her to exercise her discretion in a manner consistent with how the voters feel now, and not when she was elected. Then, I heard something about a Clinton pledged delegate from OR being pressured to change her mind notwithstanding the law in her state required her to stick to her candidate. The law? You mean, the citizens of some states have enacted laws requiring pledged delegates they elect to follow the party’s candidate into the convention? And that’s when the stark nature of the politics hit me: since Clinton for whatever reason had suspended her campaign, her delegates were now unprotected. Obama’s people swooped into the void and were picking them off, like sheep, one by one, on their way to the convention. I knew if she was to have any chance at the nomination; those of us who supported her candidacy would have to shepherd her pledged delegates through to the nomination. I posted my thoughts throughout the blogosphere, especially on the PUMA PAC blog, which received hundreds of thousands of hits in the days leading up to the convention. This is fabulous! Nice work. I know of another state – either WA or OR – because I heard this last night on riverdaughter’s radio show. (I went to riverdaughter’s site to pull up the show but was unable to access her site, while she is away.) Anyway, PUMAs from GA can contact HRC delegates from that state, to make sure they know the law in their state and ask whether the state party has pressured them to switch to BO. If GA HRC delegates have been pressured, PUMAs can propose they could write a “Cease and Desist” letter to the head of the state party, copied to the S of S, advising them to stop extorting HRC pledged delegates to violate state law by committing to switching to BO before the convention or risk being replaced at the convention. We need to have everyone’s back, not just HRC; because everyone’s back we cover, covers her. We need to have the backs of the state delegates so they can back HRC. These are ordinary people, like us. Many of them probably are here for the first time, and have been blindsided by all of this. All I want to do is empower them to stay the course. Otherwise, they will be replaced (in states where this is possible). Unless we protect our delegates, both pledged and unpledged, that is, super, they cannot protect HRC. And if the national party wasn’t afraid she could still be the nominee, they wouldn’t be advising the state parties – I am certain this is coming from the top – to reign in HRC’s pledged delegates in their states. The information I am providing for you is actually a step-by-step self-help manual. These are incidents of first impression. That is, nothing like this has ever happened before. So, I figured out a way to address the issue. Then, call your state delegates pledged to HRC. These are ordinary people, just like us. Some of them are first-time office holders. They probably feel as blindsided as we do. After all, they are party members, too. The woman in CO hired a lawyer; but no one should have to hire a lawyer to protect herself from attacks by her own party. Explain you are concerned as a Democrat, as a puma (generic), or as a citizen of the U.S.A. about what is happening to the Democratic party. If they have been pressured, take notes. Tell them you’ll get back to them. Then, come back here, and I will guide you where to go next. “Clinton supporters debate merits of roll call vote,” a USA Today report (published on abcnews.com) on August 13 tells of a continuing divergence of views on both whether Clinton’s name will be called on the roll; and the reasons as to why. One of those supporters is Allida Black, a George Washington University historian who said she cashed in her retirement savings to finance travel to 14 states for Clinton. Black, a Clinton delegate from Virginia, is helping circulate the nominating petition. “This is not a spite Obama effort,” she said. “This is for Hillary to get the respect her campaign merits.” Id. Professor Heidi Li Feldman, Georgetown Law, maintained a blog called Heidi Li’s Potpouri, a must-read on the days leading up to the convention. On August 13, she posted the copy of a nasty letter Obama’s agents had sent to Clinton pledged delegates in GA. But there was no mention that GA was a vote binding state. Now, for the first time, I looked up GA law. And there it was. In fact, the GA law not only requires pledged delegates to support their candidates at the convention but also contains an advisory opinion from the GA AG, supporting the law and explaining its intent. I posted this information on Heidi Li where, like all other comments, it went into Moderation. Then, I began wondering just how many other states had these vote binding laws. And whether this same nasty letter that had gone out to Clinton pledged delegates in GA had gone out to her delegates in those other states, too. Later, I went back to see whether Heidi Li had posted my comment; and whether anyone from GA had responded with a comment containing references to the vote binding law in that state. By now, several comments had come through Moderation. Mine was the only comment about the binding law in GA; but in the comment posted just above me, someone identifying as a Clinton pledged delegate from NC claimed, that mean-spirited letter that had been sent to Clinton delegates in GA had also been sent to her! I checked; party delegates are not bound by the results of the NC primary. But now, I knew Obama was ‘pressuring’ Clinton pledged delegates to switch their votes to him in states throughout the country; and that in some of these states, delegates were bound to the candidate through the laws of their state. In my mind, agents for Obama enticing Clinton pledged delegates in vote binding states to switch their votes to him before the convention, were breaking the law! I decided to turn them all in. On August 14, CNN reported, “Clinton’s name to be put in nomination.” Pointing to the obvious, they let us know, “Many die-hard Clinton fans have been hoping that her name would appear on the ballot.” Id. That same day, ABC News’ Kate Snow also reported, “Deal: Clinton’s Name Will Be Placed in Nomination at Dems Convention.” “Some details are still being worked out, but Clinton’s name will be put into nomination at the Denver convention on Wednesday.” Id. “What also hasn’t been settled yet is who will nominate Clinton and whether she will stand up with the New York delegation when they are called on.” Id. “What has been settled, however, is that after both Clinton and Obama names are placed into nomination there will be a roll call vote.” Id. “What has also been hashed out is that at some point during the convention, Clinton will release her delegates officialy (sic) to Obama and that she will make it very clear that she is voting for Obama, the source said.” Id. 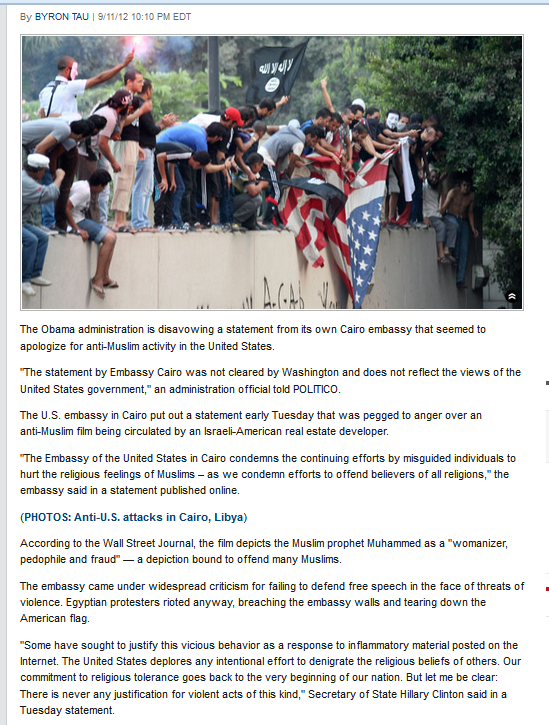 (In June 2005, Mr. Zeleny, then working for the Chicago Tribune, interviewed then newly-elected U.S. Senator Barack Obama. Anyway, on August 14, Mr. Zeleny reported, “Clinton’s name will be placed into nomination at the Democratic National Convention, a symbolic move approved by the Obama campaign in an effort to soothe a lingering rift with Clinton supporters.” Id. “After the state-by-state roll is tallied, Mrs. Clinton is expected to turn over her cache of delegates to Senator Barack Obama.” Id. Summing up all of these reports from ABC, CNN, and the NYTimes on August 14, the great news was, everyone has agreed, Clinton’s name will formally appear on the ballot for the nomination; there will be an open roll call vote of all state delegations from the floor of the convention; and then she will release her cache of delegates making (most of) them free to vote for Obama and endorse his nomination. Okay. Now, I could focus entirely on maintaining her delegates up to this ‘open roll call vote of all states’ for the nomination. That same day, I began to formulate an action plan to turn in Obama’s gang to the A’sG of the vote binding states. This became the basic set-up of the project. 1) Find all of those states where the law required pledged delegates to stick to their candidates on the floor of the convention. 2) Obtain the names and contact numbers for A’sG, S’s of S, and state party Chairs in each state. 3) Identify, if applicable, any examples of delegate harassment specific to the state. 4) Compose a letter to the state AG citing the law and the harassment, requesting intervention to stop the illegal conduct. 5) Find names and contact information for Clinton pledged delegates in the state. 6) Identify local and national media outlets. 7) Recruit citizens in the state to carry out the project. Here’s how it eventually worked. Citizens in the state printed and signed the letters to the AG with their names and addresses. 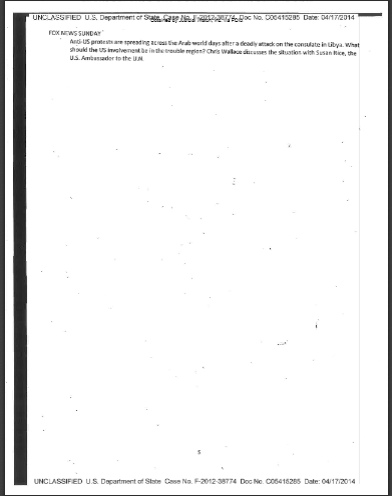 These were faxed out to state officials, and copied (with or without identifying information) to party Chairs. Then, we sent blind copies to Clinton pledged delegates – often the only contact information we could obtain was street addresses, so these copies were sent via snail mail – along with this handwritten note near the signature line: “We have your back. PUMA.” Copies were then distributed to the press. I launched the project on the PUMA PAC blog. These are just a sample of the comments I posted on that well-read blog on one day, August 14, beginning in the wee small hours of the morning. The bc issue isn’t ripe until after the convention, in some states, 24 hours after the convention, if he is nominated, and files nomination papers with the individual S’s of S. Blogging on other sites, I explained all this, and directed people to look for filing deadlines in their states, because the challenge window is based on these filing deadlines. Anyway, since no one can do anything about this bc situation until after the convention, please, focus on what needs to be done to secure support for HRC at the convention. And this means supporting the delegates, pledged and unpledged, to support her. This is what I am trying to do right now. And more explanation in the ongoing formulation of my plan. read this and then, help me do something about it! Fellow PUMAs, BO’s emissaries from Chicago are now pressuring state delegates, too; and Chairman Dean is doing nothing to stop them. Here is an example of what they are doing in GA. Remember, GA is one of those states that requires their pledged delegates to stick by their candidates through the 2nd ballot at the convention. We have to help these pledged delegates from this not-too-subtle extortion! Who is from GA? I will check in before noon. Please, we need to contact GA pledged delegates. 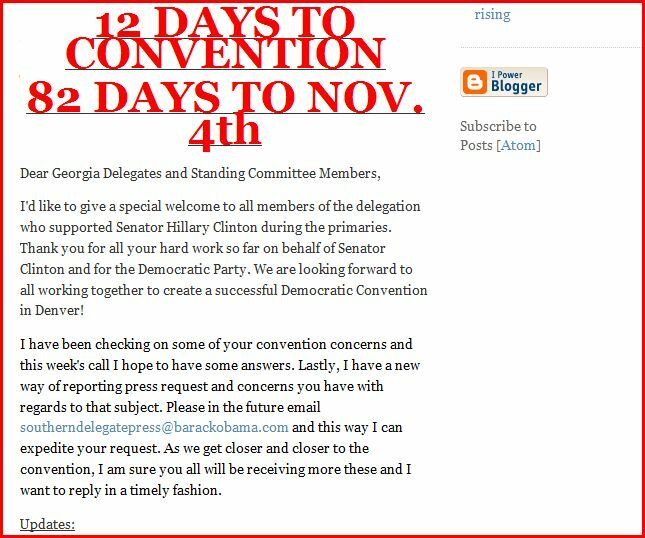 You can get their names from the GA S of S. Once we help delegates in one state, all of this harassment will stop. But that state has to have a state law requiring pledged delegates to stick by their candidate; and evidence of harassment. I stressed the importance of carrying out this project (as opposed to other ‘PROWLs,’ the name for the ‘action projects’ posted daily at the top of the blog). Nothing sent to the head of the state party will accomplish the goal of protecting the pledged delegates inasmuch as 1) you are asking the oppressor to stop oppressing; and 2) the pledge delegate in jeopardy does not know you have her back. We have to get to the actual delegate; and she has to be willing to report the illegal conduct either through a “Cease and Desist” letter to the state party; or notice to the S of S. And everything needs to be copied to the press. Coercing pledged delegates to violate state law is really big. (This is different from the scenario described in Heidi Li’s link, wherein Chicago is pressuring these delegates to disclose their votes in advance.) Like, if this is a DNC directed campaign to get the state parties to exert this pressure to switch allegiances, on pledged delegates who are required by law to support their candidates, we’re talking RICO-type conspiracy. This is FBI territory. Throughout the day, I posted pointers, like this. The state party is required to provide the identities of party delegates to the S of S. Call their office; these people work for you. Do not bother calling the state party; this is not worth the runaround you might get, and your resulting frustration. Note: Pledged delegates are not super delegates. That’s why I want people in their states to contact their pledged delegates. We do not want HRC’s pledged delegates to feel they are hanging in the wind; and we have no idea how much support HRC is able to provide to them, given this present repressive situation. If GA is getting these conference call calls then, other states must be, too. But what makes this worse in GA is that, by law, pledged delegates must support their candidates through at least the first round at the convention. That’s why I am so desperately looking for GA pumas. I posted information on other potential vote binding states, including CA. (e) The California primary election is a “binding” primary. Before I can tell you what to do in CA, I need to know what that word “binding” means here. Call the S of S elections division (916) 657-2166. 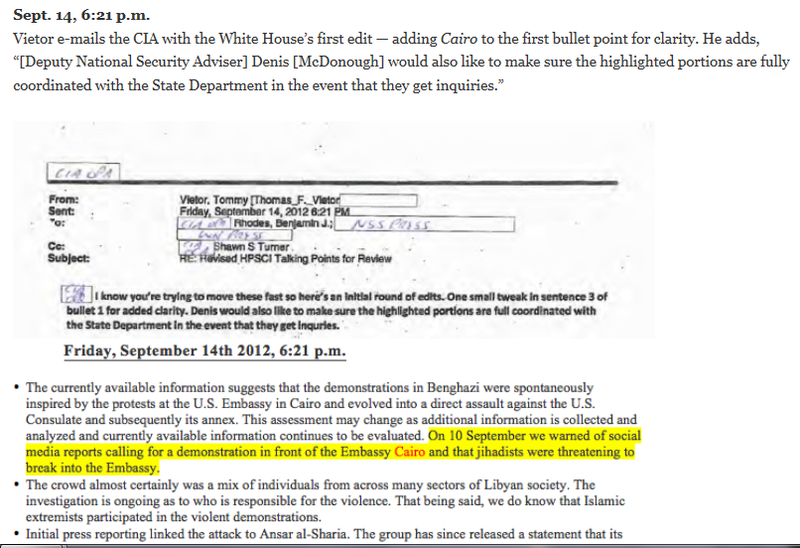 I sought favors; can someone please contact Jeff Zeleny? CAN SOMEONE DO THIS FOR ME? I AM SO BUSY ON THIS BLOG TODAY I HAVEN’T EVEN … YET! And posted more pointers on the project. However, in certain states, including OR and GA, pledged delegates must, as a matter of state law, follow their candidates into the convention. So, for example, urging a pledged delegate to change her support, before the convention, is not only encouraging her to violate the spirit of the DNC Rules but also to break state law. As I continued my research, I alerted readers to other vote binding states. PLEASE CALIFORNIA PUMAS I admire your spirit but after I looked up your laws for you, I came up with this question, which no one is answering for me: what does that word “binding” mean here? You can call the S of S elections division (916) 657-2166. This will determine how best to proceed in your state. (Each state is different, which is why I have been asking you to identify your state. ) Also, I need people in each state to SPEAK to a pledged delegate to confirm HRC pledged delegates in each state are being contacted by BO’s people in Chicago and asked – under various ploys – to identify their candidates. Still trying to confirm CA. 2. Call some pledged delegates and find out whether they received a letter from BO’s people in Chicago, like the one on Heidi Li’s site. Then come back here and tell me what you found out. And at the end of that very long day, a plea for HELP! 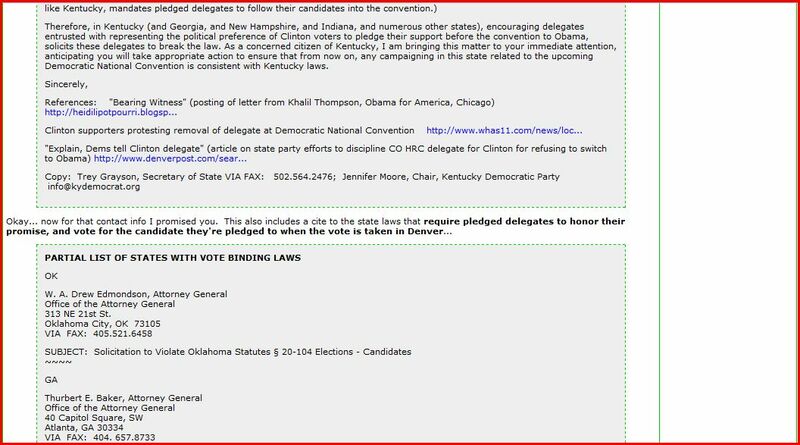 Turns out, there are states out there that require pledged delegates to support their candidates through the first vote at the convention. So far, there’s OR; and GA; and IN. I need PUMAs organized by state. Now. But I cannot organize you – I am too busy researching your laws and writing state-specific letter. GA will go out, first. Tomorrow. Because the AG of GA has already written an advisory opinion explaining the intent of the law; and supporting the law. I anticipate the AG will not take too kindly to people from Chicago encouraging pledged delegates in his state to break the law. Citizens of GA pouring through thousands of comments posted on the blog each day, eventually found my comments and responded with their emails. In this way, we assembled a team I began referring to as ‘my Georgians’ to carry out the project in just that one state. At the same time I was researching the laws, obtaining the contact information, and writing the letter to the AG for the next state. And communicating the state vote binding project to readers of other people’s blogs, and recruiting citizens of each state to get out the letters I had written, state by state. The next day, August 15, Ann Kornblut reported in the Washington Post these variations on the plans for the open roll call of all states on the floor of the convention that had been reported just the previous day. My letter to the AG of GA went out that same day. Copies were distributed to the SoS, the Chair of the state D party, and hundreds of state and national media outlets. Here in Georgia, pledged delegates selected as the result of votes cast for Senator Clinton in the Presidential primary election are legally required to vote for her during first-round balloting at the party’s nominating convention. OPINIONS OF THE ATTORNEY GENERAL appended to the above-cited law explains, “This section reflects the legitimate interest of the state in insuring orderliness in the electoral process, and it provides a means of presenting the political preferences of the people of this state to a political party.” But in what can at best be interpreted as an overzealous advocacy on behalf of Senator Obama, in states throughout the country, including Georgia, proponents for his nomination have bombarded her delegates with subtle and not-so-subtle pressures to commit to switching support to him, before the convention. Or, failing that, they replace the Clinton-pledged delegate with one loyal to Obama. (See examples below. 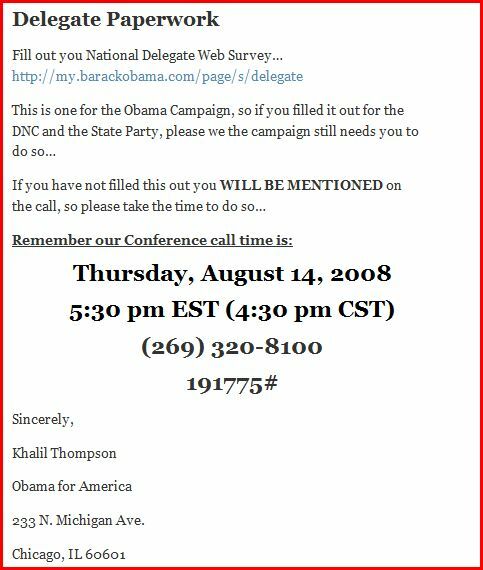 Note that while the first link shows the copy of a letter Senator Obama’s campaign sent to pledged delegates in Georgia, they distributed this same letter to delegates in all states, including states which, like Georgia,mandate pledged delegates to follow their candidates into the convention.) In Georgia, encouraging delegates entrusted with representing the political preference of Clinton voters, to pledge their support before the convention to Obama, solicits these delegates to break the law. As a concerned citizen of Georgia, I am bringing this matter to your immediate attention anticipating that you will take appropriate action to ensure from now on, campaigning in this state related to the upcoming Democratic National Convention is consistent with Georgia laws. Readers began posting states in which stories of irregularities regarding Clinton pledged delegates had been in the news. 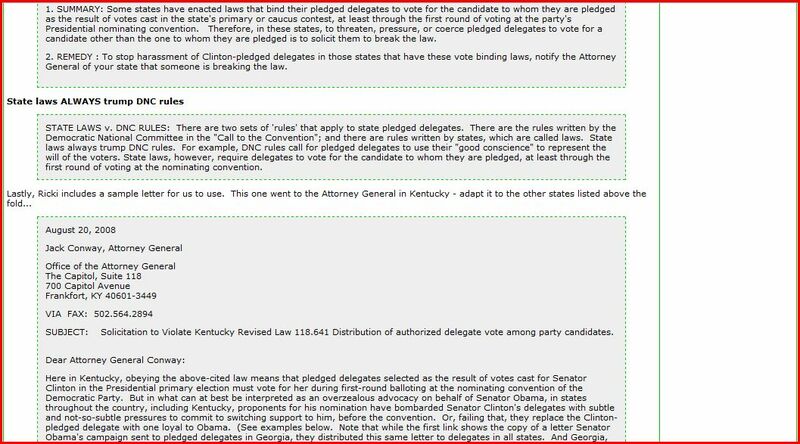 a link about Kentucky delegate..clintonrules posted it. On the 15th, PA Governor Ed Rendell (D) appeared with Neil Cavuto on FOX and misinformed the viewing audience, there is no such thing as a “pledged” delegate. You are going to have to reach PA delegates who might not know Ed Rendell does not know what he is talking about. He’s saying there’s no such thing as pledged delegates within the Democratic Party. 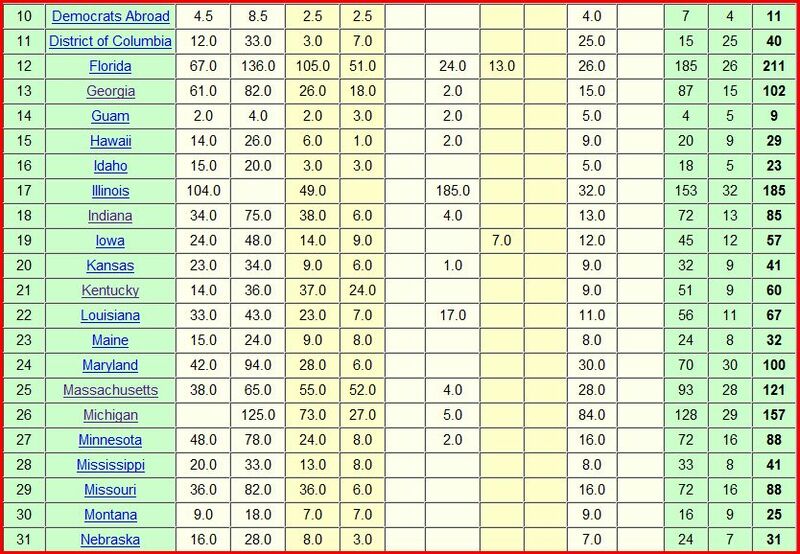 And, since PA delegates are unbound, they don’t know that in other states, including CA (we think), delegates are bound. So they might believe all delegates will switch their votes to BO, meaning even if they wanted to vote for HRC, their votes won’t matter. Anyone from Oregon – Do a shoutout to other Oregonians. Have them email you and put their addresses into a group marked OR. I am going to have you send this to me. I am writing your state letter now! Does anyone have any information on the OR HRC delegate being pressed to switch to BO? I can’t find this; but I heard this on the radio. Anyway, I really want to include a link in the OR letter which, otherwise, is ready to go. 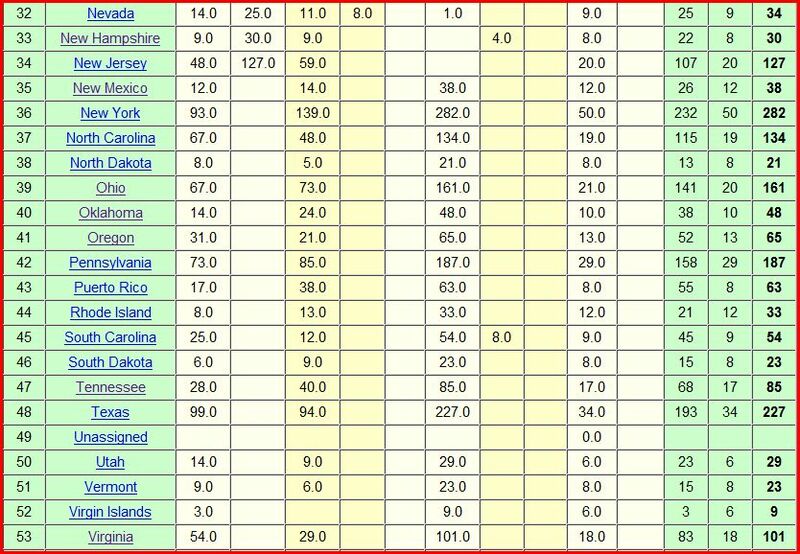 WHERE ARE MY OREGONIANS? I am dancing as fast as I can. Here is a wonderful wrap-up from one of my Georgians of the maiden effort in the vote binding project. OK Pumas, let’s all cheer up. Just to let you know, in concert with our fellow Puma, jbjd, we GA pumas fought back against delegate intimidation today. Jbjd wrote a wonderful letter in legalese which was faxed to our Att Gen and Sec of State. We sent copies through snail mail to all pledged delegates letting them know we have their back. I know jbjd is eager to help each of you in your states, but please realize that she must carefully research the laws of each state in order to craft the letter properly. Let’s all be patient as we fight the strong-arming and intimidation of delegates. A reminder we are on the side of the law. I am only working on pledged delegates because they are being harassed to change their minds. And I wanted to start in states whose laws require pledged delegates to follow their candidates into convention because anyone who coerces a person to break the law needs to be stopped. CA, Nancy Pelosi’s home state is confirmed, and gearing up to go! Still trying to reach the delegates before they head out for Denver. State delegates can be reached by snail mail. It would be great if we could get these letters out tomorrow. 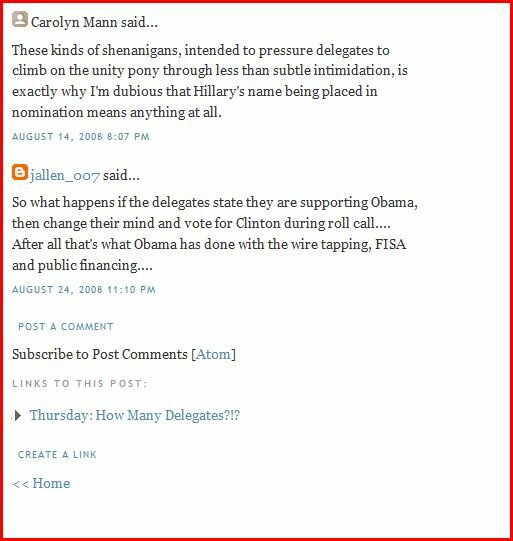 On the 16th, I posted the epiphany that Obama and the DNC are rigging the nomination. I posted yesterday that I saw Ed Rendell on Neil Cavuto, rejecting NC’s proposition that HRC could still win if enough delegates changed their minds, with this statement: ‘That’s not going to happen; delegates can vote for anyone they want and they will vote for BO. We haven’t had a robot rule since the 1980 Kennedy Carter convention.’ After seeing this on t.v., I began posting here to remind you PUMAs that some states require, by law, that “pledged” delegates must vote for their candidate at least through the first round of voting at the convention. I warned you the DNC was engaging in a campaign of misinformation aimed at state delegates, who may or may not know what is the law in their states, to get them to think voting for HRC would be useless. I urged you to get word to state delegates, hold your vote. Today, I started thinking, what if “robot rule” was actually a term of art? So, I looked it up. And, sure enough, it is. And then it hit me. BO is spending this week spreading misinformation to get state delegates – not the supers – to change their votes. We have to try to stop him. Normally, this ’shepherding’ of delegates is done by the candidate; BO has been in touch with delegates in each state. But HRC cannot do this now. So we have to. This needs to be a prowl. On August 17, I ‘blew the whistle’ on the true nature of “pledged” delegates and the Democratic Party. If you are going crazy trying to figure out what’s happening with the Democratic Party, join the club. I’m not kidding. Join the club. Because it just hit me, the way to understand this Democratic nominating process is to think of The Democratic Party as what it is – a club. And the only thing that makes this club so special is that it was able to get permission from each of the 50 states to collect campaign contributions and put the names of the candidates it wants to hold office onto the state’s election ballot. That’s it. That’s all there is. Let me explain. The club determines who will be its candidate for POTUS on the general election ballot through a vote at the convention by people it calls “delegates,” which delegates obtained that status through an allocation process set by the club. That is, the club places the names of its proposed candidates on state ballots in the primary and caucus elections and then, in exchange for receiving a specific number of votes in that process, the candidates are assigned a delegate to vote for them at the convention. Most state delegates are given a special status, called “pledged.” According to club rules, when these pledged delegates cast their votes at the convention, they should use their best judgment to represent the wishes of the voters based on whose votes they were elected. Historically, by counting these delegates pledged to each candidate, the club has usually been able to predict which of its candidates will end up with the nomination at the end of the primary and caucus process, since one candidate usually garners enough pledged delegates to surpass the number the club set as the requirement at the convention. But not this year. Neither club candidate – BO or HRC – was assigned enough delegates through the primary and caucus process to secure the nomination at the convention. Luckily, the club had in place rules whereby this deficit in delegates could be made up by special delegates commonly referred to as super delegates who get to cast their votes for either candidate at the convention. The Democratic Party set up volumes of rules and by-laws that govern all these operations, with auspicious sounding titles like “Charter,” “Constitution,” “Model Rules to Delegate Selection Process,” and “Call to the Convention.” But here’s the thing about all these club rules: they can be changed at any time. According to club rules. So, if like me, you have read club rules and believe, as I do, that members of the club have not played fair throughout this presidential nominating process, am I saying there is nothing you can do about it? Hardly. And my eventual reply to the alert about delegate harassment in KY. I am all over KY – I have the law but this letter is unique since the club actually replaced a delegate pledged to HRC with one pledged to BO, ostensibly to satisfy an affirmative action requirement in either DNC or state rules – and NH. CA, GA, IN, and OR are done. When you wake up, look for the posting. Now I was put in touch with Ricki Lieberman, in NY, a muckity-muck in the Democratic Party everyone else seemed to know about but me. Here is how she was described on Huffington Post a few weeks earlier, in July. Also a former Clinton “Hillraiser” (meaning she raised more than $100,000 for the campaign), Lieberman is keeping her own private hope alive with a daily email blast to supporters, entitled “Electability Watch,” which features a cascade of negative articles and other items about Obama as a means to argue that superdelegates should change their minds in Denver and crown Clinton the nominee instead. I was also put in touch with a reporter from the LATimes. I did my best to inspire him to write a story, describing the unlawful attempts made by agents acting for Obama to coerce delegates pledged to Clinton in vote binding states to switch their votes to him. He just wasn’t interested. I’ve confirmed with two members of the state’s Democratic National Convention delegation that Attorney General Thurbert Baker sent them a letter informing them that they could not switch their vote to another presidential candidate if they are a pledged delegate to someone else. Both Clinton delegates said they planned on voting for New York’s junior Senator on the first ballot anyway. I’m currently working on getting a copy of the letter. Ricki also contacted Alegre’s Corner, another PUMA blog, to post the work on her site, and recruit citizens from these states to download their state letters and send to the identified recipients. 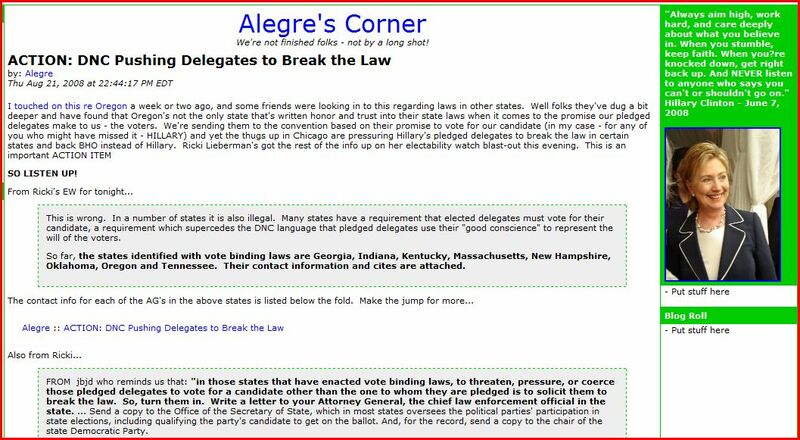 That night, Alegre’s Corner had joined the vote binding state campaign. By August 23, everyone is listening. Howard Wolfson, staunch HRC supporter and formerly with her campaign, has been a pundit for FOX since some time after HRC suspended her campaign. He just announced (remote) to Cavuto, some states have laws that require delegates to vote for HRC. WOW! WOW! WOW! As most of you know, finding these laws and getting out the word is what I have been working on! Isn’t this great news? The next day, August 24, the day before the opening day of the convention, CNN, HuffingtonPost, FOXNews, and NYDailyNews, among others, attributing different sources, announced for the first time that Clinton would release her delegates at a luncheon on Wednesday afternoon, and not after the first open call of the roll of all delegates from all states on the floor of the convention. They also announced the DNC had lifted all sanctions against FL and MI – Clinton won both states, neither one of which is a vote binding state – giving them full votes at the convention. Still left intact since its announcement 10 days earlier, on August 14th, was the plan to hold an open roll call vote of all delegates from all states on the floor of the convention. But would that plan still be in place at the start of the convention? the DNC is a private club; they make their own rules. You don’t need a lawyer to protest their breaking the rules; these are their rules. They wrote in the use of discretion throughout their charter. This means, even if they engage in conduct that looks to you like it is against their rules, this doesn’t mean it is against the rules. It means you don’t like the way they exercised their discretion.